The thought of getting fit doesn’t have to fill you with dread anymore! Whether you’re up for working indoors, outdoors or at home, there’s an option that will make you smile while you sweat. In the last year, classes like Zumba® fitness have led people into a less structured class format. Less structure can mean more fun, giving more people an incentive to give a fitness class a go. Having tried a class myself, I know they are fun – it’s more about moving and keeping fit than looking perfect. More Miami pool party than a boring exercise class, Aqua Zumba pool classes take Zumba® into the swimming pool. The world music and high energy moves are the same, but the ‘Aqua’ instructor presents the class from pool-side, directing the movements to Salsa, Merengue, Cumbia, Reggeton and other rhythms, whilst using water resistance for an invigorating workout. The aim of the class is to have fun and getting fit is an additional bonus! You can get fit without setting foot in a gym, with the help of the lovely people at Essex Boot camp. Over 70 per cent of members use the Boot Camp as an alternative to the gym, and it’s a surefire way to get some fresh air and fun while you’re working out. Don’t let the ‘Boot camp’ tag put you off, it’s suitable for pretty much every level of fitness and I’m reliably informed that the trainers aren’t mean at all! Each session is an hour of seriously fun outdoors training, in parks, woodlands and forests which uses ex-military or specialist fitness instructors to challenge you and get you fit with a smile on your face! Every session is different, so you won’t get workout boredom, either. Not wanting to go out is no longer an excuse if you want to get fit. There are a myriad of fun ways to improve your fitness at home, depending on your bank balance and the amount of room you’ve got. Remember hula-hoops when you were at school? Not the potato snacks, but the hoops you used to be able to keep going for hours? Well, I bet you can’t now. Fitness hooping has taken off big time, with equipment, classes and DVDs all on hand to help us achieve the necessary hip wiggle to keep the hoop going. My record stays at a resolute four minutes. You can get an exercise hoop from places like Amazon and Tesco, or go for the whole kit from a specialist like www.hoopnotica.com. If you’ve got a games console, there’s no reason – except for an exceptionally small living room – why you can’t use it to get fit and have a really good laugh at the same time. Abba – You Can Dance for the wii. You don’t need the wii fit board; you just plug in and play. Wiggle and prance along to Dancing Queen and Mamma Mia and you’ll be fit in no time, even if you do make a spectacle of yourself doing it. Just pray the evidence doesn’t end up on Youtube! If Abba are way too kitsch for you, you could opt for ‘Let’s Dance’ instead? There are now three versions, all featuring chart hits from people like Jessie J and Cee Lo Green, and old favourites too. All you have to do is follow the moves on the screen. Wii users can also try Zumba fitness in the comfort of their own homes. What are you waiting for? 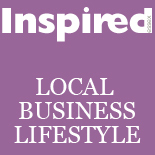 This entry was posted on March 3, 2012 by inspiredessex in Beauty & Wellbeing, Fitness, Ladies Time Out and tagged Inspired Essex Magazine, rgin active, zumba.